Get your Texas insurance license using an America’s Professor online training course. Our comprehensive video lectures, review questions and study guide will help you learn, and retain, the material needed to pass your Texas insurance license exam the first time! These reviews are real! I am so glad that I chose America's Professor to take the course. Questions after each session are really helpful. And Jack is awesome in educating the concept and providing tips. I just took the exam yesterday and got 88! Thank you Jack and America's Professor! I stumbled across this course searching the internet for the right course to take to prep for my insurance license. The course was had so many great reviews I was a little skeptical at first! :) I'm SO HAPPY I decided to bite the bullet and take this course! Insurance is mostly boring but with the videos and books to follow along it was so EASY and interesting to learn & keep up with. The little things he said in the videos were so great and sometimes silly but it made you remember important facts! I'm not a good test taker and I freaked myself out the first time so I did fail on my first try, but I wrote to AP and they helped me work on the areas that I needed help with and I PASSED with flying colors the next time I took the test!! THANK YOU AP, you really do help us PASS!!!! HIGHLY HIGHLY RECOMMEND THIS COURSE!!! AP PEOPLE PASS!!! THANK YOU! This course gave me everything I needed to know to pass the course with a 89% and can not believe it! I am more than grateful that this course was easily available and was able to manage on my spare time. I finished the course within 3 weeks, doing about 3-4 hours daily and gave myself 3 full study days. I am ready to start this new chapter of my life and it's all thanks to the help of America's Professors. Thank you!! This course was very helpful in preparing me for my test and I highly recommend it to anyone who is studying for their license. I was nervous about taking the Texas General Lines, P & C exam but I studied the AP material and took to the test day and scored an 88 on my first try! I would highly recommend to other students! I took my test April 2nd after only being able to study here and there. (I work full time and i have 2 kids) i passed on my first try with AP!!!! This course really does help alot! I would recommend it to anyone trying to pass their P&C! I'm so excited! I took my Life Accident & Health exam on April 1st after reviewing materials for about a week and passed with a 81%. At some point before the real test I was thinking I wasn't ready. its a lot to take in honestly (33 chapters) with additional four hour state video. Mind you I was off work for the whole week prior to the exam to make sure I devoted the needed time. I had to do a refresher of all the test bank questions at the end as I was starting to forget key concepts in earlier chapters. 33 chapters isn't a piece of cake when it comes to remembering lol. Thanks to Jack once again for saving the day with his long stories which seem to be a key ingredient in keeping up with the multiple choice answers in the real test. Hello! I just wanted to let you all know that I have no background in the insurance industry and after taking this course, I passed with a 96! Honestly, Jack Morton's sincerity and sense of humor was the only thing that got me through all of that foreign material! Now on to my Medicare Certification. I will miss hearing from Jack Morton on that subject. Thank you and the highest praises for America's Professor and Jack Morton! I PASSED the General Lines P&C on yesterday (Praise God)!! Jack's technique to help students remember the content is awesome. The practice questions really help to grasp how the testers will ask questions. My only issue is that the course kept freezing up:-( Other than that, it's was great!! AP RESPONSE: Congrats on passing your exam! If you run into problems in a future course please let us know. We always like digging into whatever the issue may be for our students, even if it's only a slow internet connection. Piece of cake! The Life & Health exam was slain with ease thanks to America’s Professor and the fictional but humorous exploits of Jack and Nancy. America’s Professor was able to take this dry knowledge of insurance and turn it into something digestible for the masses. Do yourself a favor, save your time searching the internet for a pre-license course, “TAKE AMERICA’S PROFESSOR NOW AND PASS! Enough said.. Good luck..
After using this pre-licensing course I just passed the Life & Health exam with a score of 93! Before I purchased the course, I read reviews of the other 1600+ people who had great things to say and what I experienced was the same as them. I bought the course a week ago and I read through all of the course material, but did not watch any of the videos. I took each quiz and then printed each quiz out and read the quiz questions and answers. Then I took each of the main section quizzes twice and the final exam quiz. I felt extremely confident at the pre-licensing exam and there were only about 10 questions I felt like I hadn't seen before. Some of that has to do with the way the test is written, which Pat said would happen. The overall course was put together very well. I studied for a total of 34 hours and enjoyed learning all of the new information. If you study an appropriate amount of time you can easily pass the exam with this course! Thanks Pat! Praise God ! I just took the Texas General Lines P&C test and passed on my first time. Thanks America Professor I was well prepared. So glad I choose this pre-licensing course. Jack is great at taking complex concepts and breaking them down into simple, real world examples. I lost my textbook and AP sent me a new book for FREE. No questions. I took the test and passed first time. There is no way that you fail if you take the AP course and follow their guidelines. Please also check our frequently asked questions about the Texas Insurance Licensing Exam. Whichever insurance license you’re pursuing, one thing is certain: You’ll need to study diligently and retain the information you learn in order to pass your exam. This is where America’s Professor comes in. We’ve been helping people prepare for their insurance licensing exams for decades with our comprehensive pre-licensing courses. Our “better-than-live” video lectures are designed to help you make sense of the material. We present real-world scenarios that are interesting and engaging to help you actually retain the information. Prepare: Once you’ve decided which license you’re going for—property & casualty, life, accident & health, etc.—enroll in one of our online pre-licensing courses to help you prepare. Our courses include 24/7 access to our online videos for 45 days (with extensions at no charge, if needed), a hard copy textbook that complements the online videos, plenty of sample questions and practice exams, and world-class customer support. Pass: Each state, including Texas, has its own licensing requirements, and all 50 states require you to be licensed to sell insurance or discuss insurance transactions. Taking our comprehensive pre-licensing course and studying up until the day of your exam is the best way to pass your exam the first time. 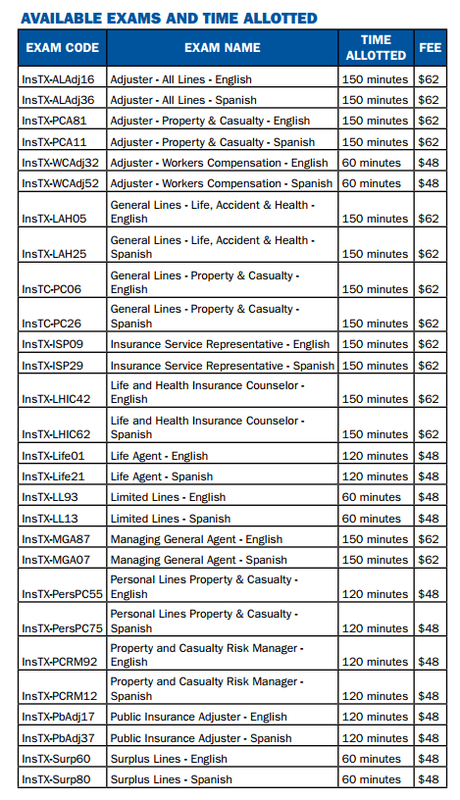 Apply: Once you pass the exam, you can formally apply for your insurance license and begin working/selling! Texas offers several different exams, all of which require a score of 70 to pass. Note that each exam consists of two parts: a national insurance section and a state-specific section. You will need a score of 70 on both parts—the two scores are not averaged. For more information about which tests are the toughest, test center locations, the number of questions on the different exams, and more, click here. Test Registration: You must register for the exam by calling Pearson VUE (the testing company) at 1-888-754-7667. Calling at least 3 days in advance of the date you wish to take the exam will help ensure you get the test date and time of your choice. Testing Centers: There are many test centers throughout the state of Texas. See the “Where can I take the Texas insurance exam?” section on this page, or use the Pearson VUE website to find a test center near you. Licensing Application Fees: The Texas Dept. of Insurance charges $50 per license for General Lines-Property & Casualty or General-Lines, Accident & Health, or $150 for a temporary license. Fingerprinting: The Texas Dept. of Insurance requires insurance agents to be fingerprinted. You can schedule an appointment for fingerprinting at identogo.com or by calling 1-888-467-2080. The electronic fingerprint fee is $41.45 (may vary). Look no further for information and resources on how to pass your insurance exam—America’s Professor is your trusted provider for comprehensive insurance pre-licensing courses!